More than 100 people crowd a Rutland Board of Aldermen meeting. Critics of a plan to bring 100 Syrian refugees to Rutland lambasted city officials and resettlement experts during a heated Board of Aldermen meeting on Wednesday night. Many aldermen complained that they were shut out of deliberations on the plan, which was hatched by Mayor Chris Louras and the nonprofit Vermont Refugee Resettlement Program. The plan, which Louras and other supporters say will bring economic and cultural vitality to a city suffering from population loss and abandoned houses, has sparked heated reactions since it was announced in April. Officials from the Vermont Refugee Resettlement Program attended the meeting to answer questions from the aldermen and the public. Aldermen devoted their time to criticizing refugee officials for not seeking their input before naming Rutland as a refugee location. 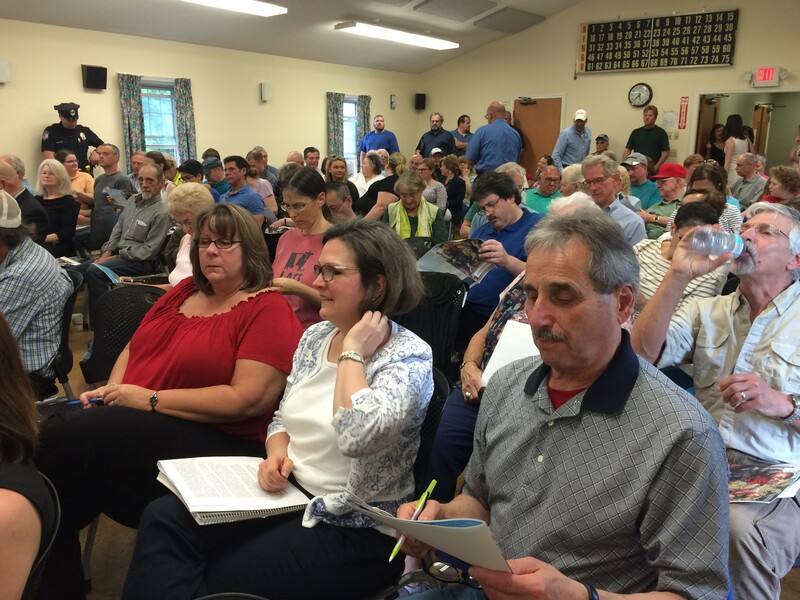 Most of the members of the public who spoke Wednesday night were opposed to the plan. “Once it’s embedded in the community it’s kind of like drugs — you can’t get rid of them,” Maurice Fredette said. One woman said she feared the refugees would impose Sharia law in Rutland. Many in the crowd applauded her. The Vermont Refugee Resettlement Program places most refugees who arrive in the state in Burlington and Winooski, but its leaders have long wanted to establish a second hub. The organization chose Rutland over a half dozen other communities — Woodstock, Middlebury, Brattleboro, Bennington, Warren and Waitsfield — that expressed interest in hosting the Syrians. The refugees, who are currently living in camps in Jordan after fleeing their war-torn country, are scheduled to begin arriving in October. Resettlement program director Amila Merdzanovic said the organization has long hoped to add a new refugee hub in the state. While Board of Aldermen approval is not required to bring the refugees to Rutland, Merdzanovic said her organization values community support. More than 1,000 people have signed onto a Facebook page supporting the refugees, and more than 170 people crowded a church meeting earlier this month offering their help. But the crowd Wednesday night was in no mood to offer support.